Singles of Cuckoo, Whinchat and Spotted Flycatcher were about the only new migrants on the land whilst ten hours coverage of the sea today produced three Pomarine, eight Arctic and one Great Skua and a lingering Black Tern of note. A Hobby also came in. 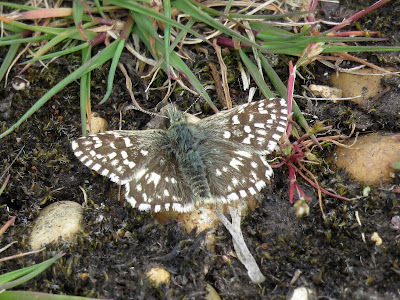 The warm weather is bringing out the butterflies with a Holly Blue in the Lighthouse Garden of note along with at least six Grizzled Skippers, two Green-veined Whites and two Red Admirals. Three Porpoise and a Grey Seal were seen offshore. 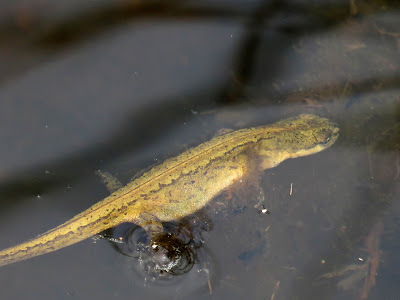 I rarely come across newts in the recording area but I have been seeing the odd one recently in the still flooded temporary pools to the south side of the trapping area. 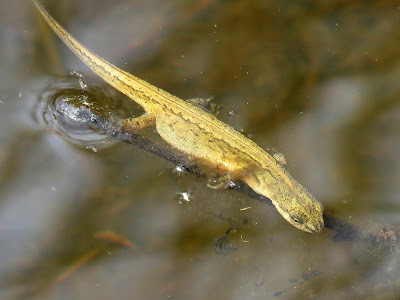 Today though I was surprised to see at least 12 Smooth Newts Triturus vulgaris in the pools including several males in breeding colours.